Pursuing the fine art of minimal and techno, Oliver Schmitt aka Sounds of Revolution spared no expense creating new beautiful sounds for your productions. Distributed through label Resonance Sound, each sound nails down the facettes of Techno and Minimal to the point and supports your music full of power, intoxicated with the latest state-of-the-art Minimal and Techno elements labels are offering right now. 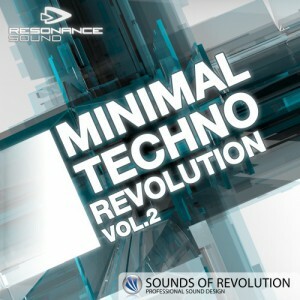 Following the multi-magazine-awarded Minimal Techno Vol. 1, this one is again full of fresh clicks and glitches, weird loops, awesome percussions, groundshaking effects, Vocals and just so much more making your next techno production session so exciting! Besides being handcrafted with all modern studio weapons, the loops (127 bpm) are leaving enough headroom for all those little spices you might have in mind for your next hit. Carefully sorted into lots of categories, available in the most popular sampler formats and at a total of 628 loops and 561 oneshots and drums there’s nothing for you to worry about – well, maybe that you’ll be spending too much time tinkering in your studio. Once again, Schmitt has crafted a stunningly produced example of cutting-edge electronica. This is a large and well thought-out library packed with immaculate engineering and club-ready sounds.